Put warmed milk, Sugar In The Raw Organic White, and yeast in the bowl of a stand mixer fitted with a paddle attachment. Let sit for about 5 minutes or until bubbly. If it doesn’t bubble, throw out the ingredients and start over. With the mixer on low, beat in butter, salt, cinnamon, and eggs. Add the flour slowly and beat until combined. Switch to the dough hook and knead until the dough comes together and becomes smooth. Add in raisins and knead until the raisins have been incorporated. Spray a large mixing bowl with oil and transfer the dough to the bowl. Turn to coat, cover, and let rise for about an hour or until doubled in size. Spray a large, rimmed baking sheet with oil. Turn the dough out onto a lightly floured surface. Divide into 2 and then divide each half into 10 even pieces. 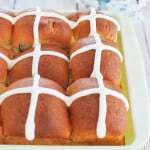 Roll each piece into a ball and place onto the baking sheet, leaving about ½” between each ball. Cover and let rise for about an hour or until doubled in size. Whisk together the egg white and water and brush the mixture on top of the dough balls. Bake for about 20 minutes or until the tops are browned. Let cool completely before icing. To make the icing, whisk the powdered sugar and milk together until no lumps remain. Transfer to a ziptop bag and snip off one corner. 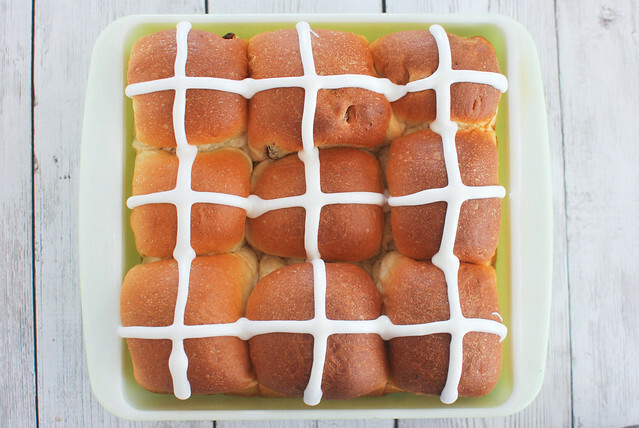 Pipe crosses on each bun. 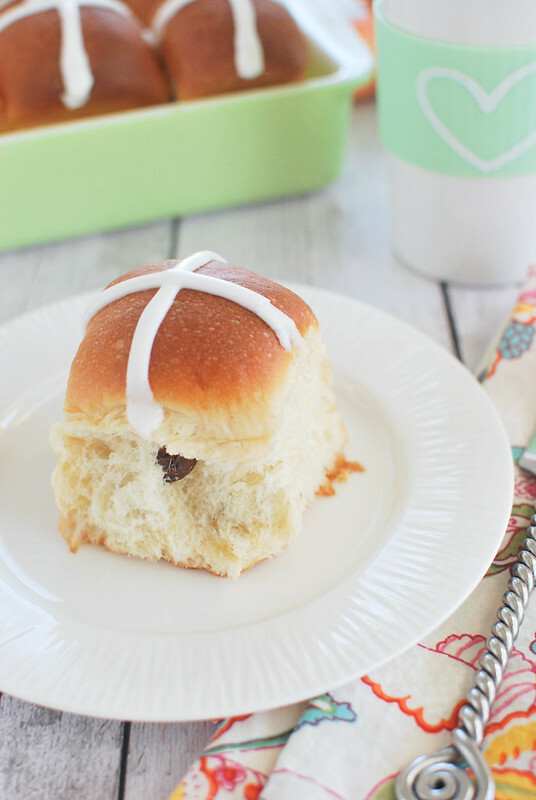 3 Responses to "Hot Cross Buns"
I have never had a hot cross bun. Now I need to make up a batch, cause those look good! I never thought Easter was my favorite holiday, but this year I am SO INTO IT. Maybe because it means spring must be here, and I am DEFINITELY excited for spring? I don’t know. 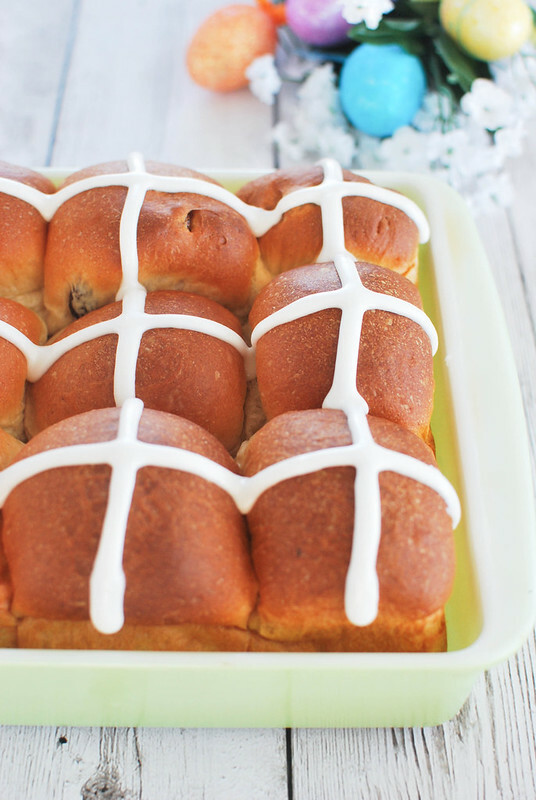 These hot cross buns sound perfect for Easter breakfast-ing!